As a follow-up to this question, what is the minimum size of a nest egg to support 30 years of $5,583.33 monthly distributions? I want the $5,583.33 to increase with inflation each month. The present value of the first payment should be $5,583.33. Is this the right equation? 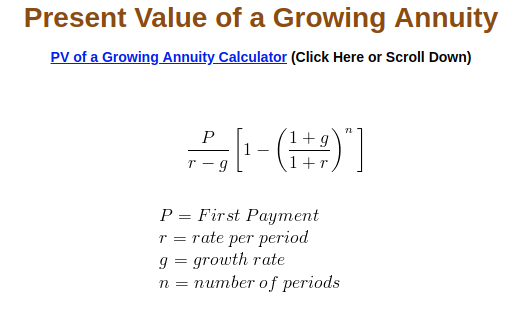 From what I could find on Google, this calculation is called the present value of a growing or graduated annuity. Is this correct? Is it correct to say that $2.5 million is the nest egg balance 20 years from now on the day the first withdrawal is made? And that $2.5 million is not in today's dollars but in equivalent dollars 20 years from now? If you want the first payment amount to be $5583.33 (unadjusted for inflation), o should be set to zero because o sets the number of inflation periods prior to the first payment received, (so that adjustment can be set from within the saving period). To illustrate with a simple example, showing 4 deposits and 3 withdrawals. Planning to retire in 4 months and draw monthly income of $1000 for 3 months, adjusted for inflation starting from the first withdrawal. APR is 8% and inflation is 4%, both nominal rates, compounded monthly. What should the pot be? There are to be 3 payments received in total, at the end of periods 4, 5 & 6. The first payment should be $1000 unadjusted for inflation. The second and third payments are to be adjusted for inflation. Calculating the pot at the end of period 3 (using formula 2). So by the end of month 6 the pot is empty. The pot should be $1,167,478.60 at the start of the month prior to the first withdrawal, which will be $5583.33. With adjustment for inflation the final payment will be $18,438.89. To illustrate what type of calculation this is, let inflation be zero. Then all the payments are $5583.33 and the required pot is only $760,915.72. Excel correctly calculates the present value and payment amount. However, it does not have the facility to add in an inflation factor. The Excel PMT calculation with cashflow at the end of each period uses the calculation of present value of an ordinary annuity, where the present value is p.
The Excel PMT-type function can be derived from the sum of the present value of payments by induction. With an inflation terms added: i and o, the sum of the present value of the payments becomes this, (formula 2). Not the answer you're looking for? Browse other questions tagged 401k interest retirement-plan inflation annuity or ask your own question. Is there a formula or calculating the maximum monthly withdrawal from an investment so that it lasts a specific period of time?